Lightning fast win – solidarity and direct action work! SydSol and the ASF-IWA were contacted by Melinda, Sheila, Suko and Ulya, working holiday makers from Indonesia who worked at a factory in May and June and still had not been paid. They had collectively worked 34 days and were owed over $4,000, but despite promises (to pay… always later) they had not seen a cent. With our support, the workers protested a restaurant in Auburn owned by the same person as the factory they had worked at on 26 August. We gave out leaflets, chanted, talked to people passing by and made the situation known. Now thanks to SydSol and ASF-IWA supporters as well as public support from the community, the workers were finally paid today 29 August. Thank you to all involved, and keep an eye out for similar situations – this story demonstrates that collective action can be very powerful. Share it and inspire those around you to fight social injustice inflicted on themselves or others! Sign up to our supporters email list, to get updates and action alerts: http://eepurl.com/UGQev and contact SydSol for support in your fights. Today 26 August 2017, SydSol and the ASF-IWA took action in Auburn in support of four workers who were exploited at Fresh Cut, a factory owned by [Auburn restaurant]’s owner, without receiving any pay. Melinda, Sheila, Suko and Ulya working holiday makers from Indonesia, were promised $120 per day, working 5-6 hours daily at a vegetable processing factory. They collectively worked 34 days in May and June and are owed a total of $4,080. The boss also owns [a restaurant in Auburn] and never paid a cent in spite of multiple requests and reminders. SydSol is protesting this abuse at the restaurant, more susceptible to public pressure. The workers contacted the ASF-IWA and SydSol for help and are demanding the boss pay them the full $4,080 they are owed: Melinda 10 days, Ulya 6 days, Sheila 3 days and Suko 15 days. With your help, SydSol will continue to protest and let potential customers know about how the restaurant owner handles his factory business and treats workers. We have had great community response, with an overwhelming majority of passersby showing interest and support for our action. Let’s keep this up until all wages are paid! Together we are strong and we will overcome. Keep up to date with our action, sign up to our mailing list and make sure SydSol’s emails don’t end up in your spam or promotions folder! Note: we edited the restaurant’s name out of the post and picture as a courtesy once they paid the workers. Come to the next Sydney Solidarity organising meeting where we will be discussing possible upcoming actions. All SydSol supporters are welcome – please invite your friends. SydSol organising meetings are usually held at 6pm, last Thursday of the month, at Jura Books (440 Parramatta Rd, Petersham). Feel free to email us to confirm the next meeting’s date and time. Come to the first Sydney Solidarity organising meeting for 2017. We’ll be discussing possible upcoming actions and more. All SydSol supporters are welcome – please invite your friends – you can use with the hashtag #sydneysolidarity on social media. SydSol organising meeting: 6pm Wednesday 1st February, at Jura Books (440 Parramatta Rd, Petersham). So CJ contacted SydSol and asked for help to get back her stolen wages. Together, we demanded that the boss pay CJ the full $1,108.70 she was owed – which would bring her wages up to the award minimum for the hours she worked. Over a two week period, SydSol organised 3 actions at the café. The actions were lively and energetic, with chanting, singing, banners, placards and leaflets. Between 20 and 40 SydSol supporters came to each action. During the actions we gave out almost 1,000 leaflets to passersby, telling CJ’s story. We had lots of conversations and caused much discussion on the busy Leichhardt street! Most passersby were very supportive. Each action lasted for around 2 hours, during which time almost no customers went to the café. At first the boss refused to pay. He started off trying to ignore us, but soon found that didn’t work. He then became more antagonistic, publishing defamatory messages about the ex-worker, throwing buckets of water at the protestors and threatening to break someone’s arm! The boss called the police a number of times, but no arrests were made. He even hired musicians to try to drown our our chanting! But we kept going! After the third action the boss paid the full amount owed to CJ. We won! As part of the settlement, SydSol participants agreed to remove the name of the café from our website and social media posts. Another worker from the same café also quit during the period SydSol was taking action, because of similar issues with her employment. However that worker told us that, to her surprise, the boss paid her what she was owed – almost certainly because of our actions! This was a great campaign, which resulted in a real victory for workers. We came together as a solidarity network and strengthened our organisation and ability to take action. We showed the power of direct action – action taken by oppressed people ourselves, on our own terms, and in our own interests. Sydney Solidarity Network continues – but we need you! Sign up to our supporters email list, to get updates and action alerts: http://eepurl.com/UGQev and get your friends to sign up too! Come along to our meeting/picnic at 3pm on Saturday 14th May in Camperdown Park, followed by celebratory drinks from 5pm at the Courthouse Hotel in Newtown. (In case of poor weather, we’ll be in the Courthouse Hotel from 3pm.) We need more people to get involved in the SydSol organising group! We also ask you to think about any issues in your own life, and the lives of your friends and families, to identify the problems in your workplace and your community. Problems which can be changed through direct action – like underpayments, bullying, landlords refusing to do repairs, or real estate agents evicting you without reason. And get in touch about taking action together to fix these problems! [Leichhardt] Café – pay up! 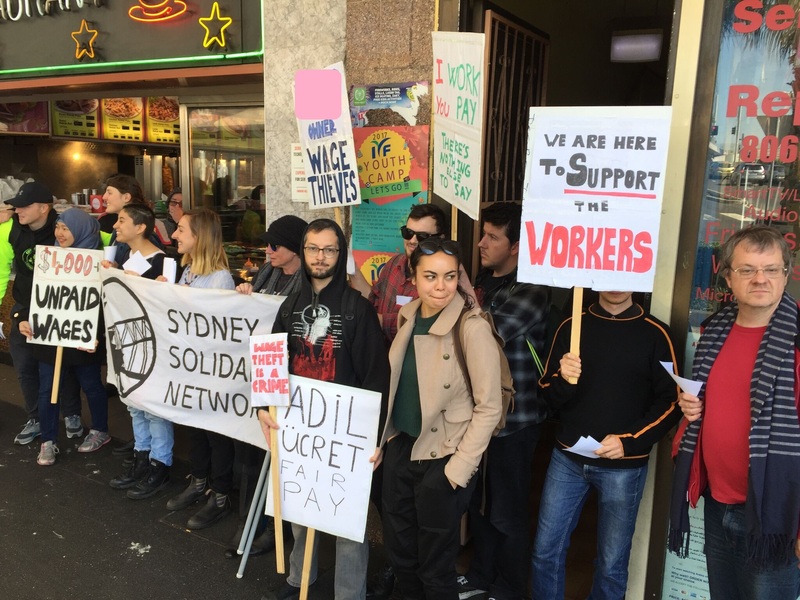 Since last week, SydSol has been taking action in support of CJ, a worker who was harassed and exploited during her time as a staff member at [a café] in Leichhardt. CJ began working at [a café in Leichhardt] in early March, and there were problems from the beginning. The boss would continually try to touch her and other women against their will. She was paid only $17 per hour, which is far below the Restaurant Award minimum wage ($22.24 on weekdays and $26.69 on weekends, for casuals). The pay was cash-in-hand, and the boss would always pay late. No contracts were signed and the boss never asked for their tax file numbers. Some workers were fired on the spot, with no notice, for no reason. When CJ spoke up, she was taken off the shift roster. She decided to quit. She asked the boss to pay her outstanding wages (at $17 per hour): $433.50. He refused, and one of the supervisors even physically assaulted CJ’s friend who was there to support her. Eventually, the boss only paid her $200 and withheld the rest ‘for damages to property’ – a completely fictitious claim. CJ contacted SydSol and asked for help to get back her stolen wages. CJ is demanding the boss pay her the full $1,108.70 she is owed – which would bring her wages up to the legal award minimum for the hours she worked. So far, the boss is not paying, and until he does SydSol is organising regular protests to let potential customers know how [this café] treats its staff. The response from passers-by has been extremely positive. The boss is also clearly feeling the pressure, threatening and behaving aggressively towards SydSol members, assaulting a female protester and even throwing large buckets of water at several people. Exploitative, violent, sexist behaviour by bosses and supervisors is all too common – both in hospitality and elsewhere. But when we stand up together, we can show that we don’t have to put up with it! Victory at cafe in Redfern! Sydsol wins again! After three actions at the Perfect Cup cafe in Redfern, Josie has been paid her superannuation. This was only $365 which was a tiny proportion of the profits the boss would have gained from her labour. Josie had worked at Perfect Cup for three months but had not been paid any superannuation. All employees earning over $450 in a month are entitled to 9.25% superannuation on top of wages earned, but despite multiple requests, Perfect Cup refused to pay up. So SydSol took action. 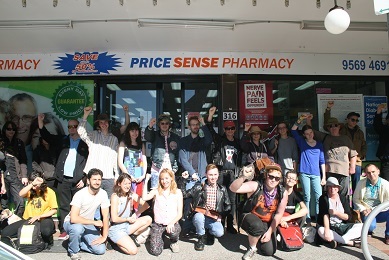 In late May over 25 members and supporters of the Sydney Solidarity Network turned out to support Josie, a worker in Marrickville, as she demanded backpay from her former employer. Josie had worked for SaveMore, a company which owns a grocery store and a pharmacy in Marrickville. She worked a ‘trial shift’ and then a second shift there in January and February this year, but was not paid for either shift. Despite Josie repeatedly requesting payment, via letters, phone calls and enquiries through her job provider, SaveMore refused to pay for either shift. So, after months of being ignored, Josie decided enough was enough. With the support of dozens of SydSol members and supporters, Josie confronted SaveMore’s owner, My Trang Nguyen, and presented a letter demanding what was legally hers – wages for the hours that she had worked. If SaveMore did not pay up within two weeks, we promised to return to leaflet passers-by and potential customers to let them know about SaveMore’s shady employment practices. For several days afterwards SaveMore lied that Josie had never worked for them. Then they agreed that she had, but tried to talk her into accepting less than the minimum wage. Then, when it was clear that Josie wasn’t backing down, they paid up at the minimum wage for a casual pharmacy assistant of $22.48 per hour for four of the seven hours Josie had worked. Although not the full amount, it’s close enough that we’re satisfied and consider it a victory! Illegal practices like wage-theft and below minimum wage payment are unfortunately very common in the inner-west. However, SydSol has shown that with a bit of organisation it’s possible to get what you’re owed! If you’re being ripped off, contact us today and let’s fight to win. In November 2013, SydSol was contacted by a restaurant worker who had been seriously underpaid. Haruki* was an international student who had worked at one branch of a large restaurant chain* for nine months, and for the entire length of his employment was paid well below the minimum wage. 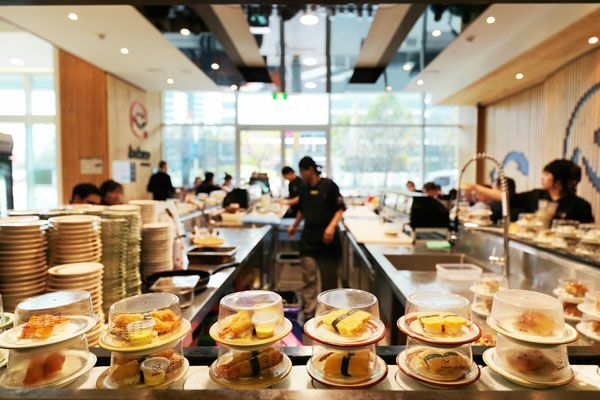 Under the Restaurant Industry Award, which sets the minimum wages for the industry, a casual cook such as Haruki should have been earning at least $21.86 per hour – his payslips, however, showed rates of $16 per hour. On Saturdays, the minimum rises to $26.24 per hour, but Haruki’s pay was only $17 per hour. And on Sundays he was paid at $18 per hour, a whopping $12.61 per hour below the minimum rate. All told, Haruki was cheated out of almost $4,500. After discussing the matter with Haruki, SydSol agreed to support him in taking action to try to reclaim his lost wages. 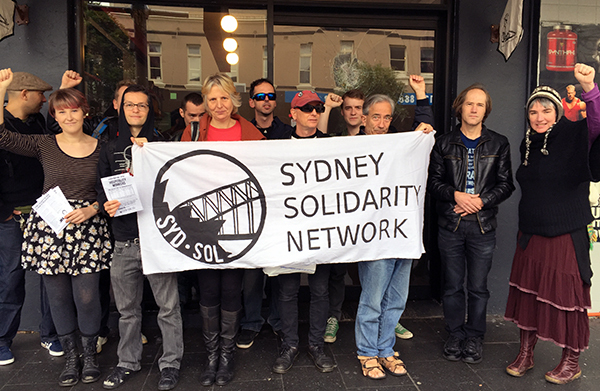 On 16 November, eight members and supporters of SydSol marched into the restaurant where he had worked. We presented a letter to the restaurant’s manager stating that unless full backpay was provided to their former staff member within 14 days, we would commence escalating protest action. Less than two weeks later, Haruki was contacted by the managing director of the entire chain (not just the offending outlet). A meeting was organised at which Haruki and the managing director negotiated an outcome that was satisfactory to both. 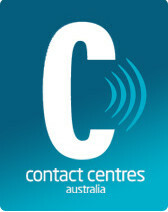 With less than 48 hours to go before their two-week deadline expired, Contact Centres Australia have caved in to our demands and paid Chris in full for the seven-hour training shift he undertook whilst employed there. Chris took a second job at Contact Centres for several weeks in April this year. Whilst he received wages for almost all the hours he worked there, after quitting he was never paid for a full-day training shift he undertook. The law requires all employers to pay staff for all time spent working, including training shifts, but despite this Contact Centres simply refused to pay up. For months Chris sent email after email asking why he had not been paid for all the hours he put in at CCA, but was completely ignored and never received a reply. Chris then turned up with 15 other members of SydSol, confronted management in their offices with a letter demanding payment, and threatened to organise protests outside their offices if payment was not received within 14 days – and then, after months of silence, Contact Centres rushed to pay up in a matter of days. The message for any other employees anywhere else is clear: bosses – even massive employers such as Contact Centres with overseas offices and over 500 staff – are vulnerable to our actions and, with a bit of organisation, we can force them to give in to our demands. If you’re getting ripped off by your employer, contact SydSol, get organised and let’s fight to win!